This was a record sent to me to review, but I couldn't even tell you how excited I was when I picked it up from the post office. The number of records people have been sending me to review lately has been increasing, but the number of good records I've been getting is a debatable topic. 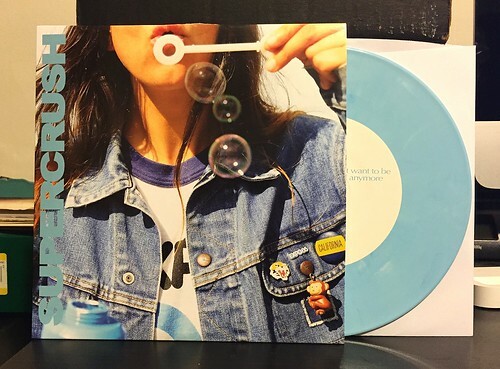 I think I can say that this Supercrush 7" is the best record I've ever been sent to review. That probably has a lot to do with the fact that I already knew and liked the band's first 7". This 7" was on my radar, but I've been trying to cut down a bit on the number of one off 7"s that I buy by themselves. With the postage, it just makes for an expensive deal sometimes. This means I'm occasionally (and I stress occasionally) missing out on colored vinyl or running the risk of just forgetting about the record. I'm very thankful Debt Offensive sent this over to me as it would be a shame to miss out on this one, plus the fact that they hooked me up with the colored vinyl version makes it even better. Supercrush is playing the kind of laid back, pop leaning alternative rock that I just loved back in the 90's. You can hear bands like Poole, The Merrymakers, The Wannadies and maybe the quieter moments of the Doughboys in these songs. Sure, that's kind of a rogue's gallery of failed major label bands (I'm in America, not Canada - Doughboys never really got big here), but all of those bands are near and dear to my heart. Supercrush is doling out the kind of warm, gigantic guitar tones with stellar melodies that can't be beat. This 7"s is one of the best, if not the best I've heard all year long. It's worth going out of your way to get and I'm hopeful that Supercrush is working on more records as we speak. I would particularly love to hear a full album's worth of material from this great, great band.